The 4th International Holcim Awards program is now accepting submissions from architects, engineers, and construction firms. The Swiss cement provider’s program awards projects for design elements highlighting sustainability in technology, environmental impact, and construction. The Wood Innovation Research Lab (WIRL) at the University of Northern British Columbia (UNBC) exceeds the exacting internationally recognized Passive House standard for energy efficiency. Home to researchers seeking to discover novel materials and techniques for the next generation of tall wood buildings, the laboratory is itself an engineering marvel. It is a certified Passive House, one of the first buildings of its type in North America to exceed the exacting international standard. 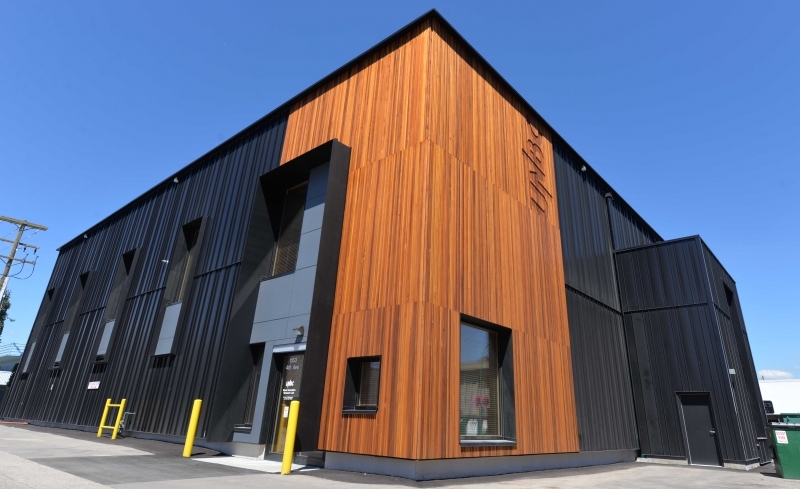 WIRL set a new standard for airtightness, securing the best North American result of any building using the internationally recognized Passive House standard, according to UNBC. The testing protocol involves both pressurizing and depressurizing the building and measuring the number of air changes per hour (ACH) that result. With a score of 0.07, WIRL surpassed the Passive House requirement by nearly a factor of 10. The result is impressive given the design requirements of the building. With a large bay door installed to facilitate the delivery of materials and a state-of-the-art dust extraction system, there is a lot of potential for air leakage. The bay door was sourced from Germany and the other doors and windows used in the project hail from Poland. European parts were required for those aspects of the building because Passive House manufacturing is still in its early stages in Canada. The 500-mm (20-in.) wide walls are rated R-80 and contain blown-in mineral wool insulation. The roof is rated R-100 and required special certification from the Roofing Contractors Association of British Columbia (RCABC). The floor sits atop 200 mm (8 in.) of expanded polystyrene (EPS) insulation. Guido Wimmers, associate professor of engineering at UNBC, and Stephanie Wall, a master of engineering program graduate, produced a comparative life-cycle assessment, looking at the wood-based Passive House design of WIRL and comparing it a wood structure, built to standard building code requirements; a steel structure designed to be a Passive House; and a steel structure built to code. The wood designs contained much less embodied energy—or energy consumed during the production of building materials and the construction itself—compared with the steel buildings. The Passive House buildings use much less energy operationally, and the wood-Passive House design scored the best overall.